Hi everyone, I have another fast and easy breakfast recipe for you today! My son loves breakfast sandwiches and he loves bagels. So he’s been asking for these breakfast bagels quite a bit lately. And they’re super easy too, which is just what I need! Melt a couple of tablespoons of butter in a skillet on medium heat. You can substitute cooking spray if you like, it’s mainly to keep the eggs from sticking. Crack an egg in to the skillet, and cook until done on one side, then flip. Place your bagel open sides down onto the skillet just to toast it a bit and heat it up. If you like you can warm a piece of ham or cook a sausage patty in the skillet as well. Once your egg is done, simply place the bottom half of the bagel on a plate and top it with the egg, ham slice, cheese, and the top half of the bagel. And voila’! You’re done! Egg, ham, and cheese breakfast bagel ready to go! Now of course, I have to make 4 of these! Serve with a little O.J. or fruit and enjoy your day! It may be obvious to most but we also break the yoke when we cook our egg so it spreads out and cooks faster. If someone hasn’t fried an egg, they may not know to do that. Was also thinking that mini bagels would be a good solution for younger kids which would also be easier for small mouths to bite through. 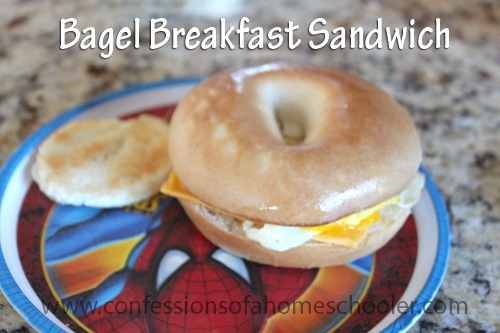 We LOVE egg & cheese on bagels around here as well! You know I’ve been stuck in such a rut with breakfast recently. It’s cereal one day, waffles next, omelets…and repeat. The kids aren’t complaining but I really like to introduce them to a variety of foods. My husband and I are from the Caribbean so certain foods were never a part our childhood breakfast routine either. My kids surely would not be interested in anything we ate for breakfast as kids (liver, calaloo, etc). LOL. I’ll have to try this bagel idea. I’ll do the mini bagels, they should like that. Thanks for the idea! Time to revamp. I’ve been making sandwiches like this for years. We used to buy them from a local cafe, but then they got a new owner who raised the price and changed the ingredients, so we don’t like them as well anymore. At my house, I typically use homemade bagels (much cheaper than store bought) and bacon instead of ham. I prefer the precooked bacon; it’s much quicker and less messy to cook. Oh, and I toast the bagels in the toaster using the bagel setting rather than putting them in the skillet with the eggs. And like Jill, I break the yolk up. That’s the way the cafe did it, so that’s the way we do it since we were trying to copy them. Yummy! What is the thing next to the bagel sandwich in the picture? It’s a round piece of toast LOL! Lettuce and tomato on a breakfast bagel – sounds gross until you try it. Yum.